The Canyon Perfect Positioning System enables you to determine your ideal frame size based on your body measurements. This is a very effective tool for making a recommendation, but please feel free to get in touch with your local Canyon Service Centre if you would like some further advice. Also, ask someone to give you a hand in order to achieve the most accurate measurements and the best results. We can determine how long your seat tube needs to be with the help of your inseam (also inside leg) measurement. In order to make your inseam measurement stand up straight with your back against a wall. Take a spirit level and tuck it between your legs (instead of a spirit level you can also use a book). Using both hands (at your front and back) pull up the spirit level or book into your crotch as if you were sitting on the saddle. The spirit level or book should remain horizontal during the entire measurement. Now measure the distance from the top edge of the spirit level down to the ground. This is your inseam measurement. 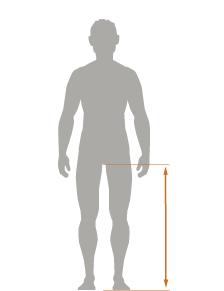 The length of your torso has an influence on your position on the bike. We use this measurement to determine the relationship between your upper body and leg measurements. You measure your torso length by tucking a spirit level or book between your legs, as with the inseam measurement. Keep your upper body completely straight. The person helping you now measures from the top edge of the spirit level vertically up to the base of your neck (top end of your sternum). 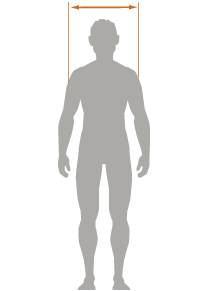 This is your torso length. We use the shoulder width to determine whether the handlebar width on your chosen model is appropriate for your anatomy. If required, we contact you about this after you have placed your order. You measure your shoulder width by feeling your way outwards from your shoulder blade until you reach the edge of the shoulder bone. You'll be able to feel this by moving your arm slightly. Stand up straight with your arms hanging down while your helper measures horizontally from the edge of your right shoulder to the edge of your left shoulder. 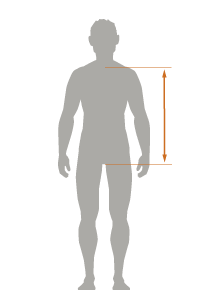 This is your shoulder width measurement. The arm length measurement provides information as to whether any special adjustments on the cockpit are worthwhile. We also contact you about this, if required. Let your right arm hang down loosely by your side and feel your way with your left hand outwards across the shoulder blade right to the edge of your shoulder bone. Then keep your left hand on this point. Then grasp a pencil with your right fist, thereby simulating holding your handlebar. Then stretch your right arm outwards away from you, turning your fist so that the pencil points vertically upwards. Your helper should now measure the distance from a point at the edge of your shoulder bone (already fixed by your left hand) to the middle of the pencil. 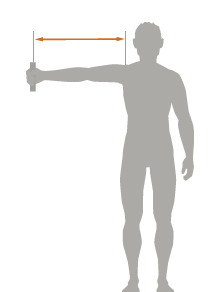 This is your arm length measurement.